The Court Guide has been updated and is being published to serve two purposes: (1) to give practical information to the community involved or interested in the court system; and (2) to provide an educational supplement to those learning about the judicial branch of government. The content and orientation of this publication is in plain language in keeping with the Council for Court Excellence's commitment to increase public awareness about the courts, and to encourage greater public understanding and support for the justice system. (Spanish Version of Community Guide to the Courts.) Esta guía ha sido actualizada e impresa por dos razones: (1) para poner al alcance información práctica a los miembros de nuestra comunidad que estén involucrados o interesados en el sistema de cortes; y (2) para apoyar a aquellos que deseen informarse y aprender sobre la tercera rama de nuestro gobierno. El Acto de derechos de víctimas enmienda de 1988 del Distristo de Columbia proporciona a víctimas de un crimen violente la opportunidad de archivar un papel que el juez considerará durante el tiempo de sentenciar.Este follete ha preparado para ayudarle a comprender sus derechos como una víctim, y explica cómo completar el papel considerado duranta el tiempo de sentenciar. Llama 202.785.5917 para ordenar por teléfono. 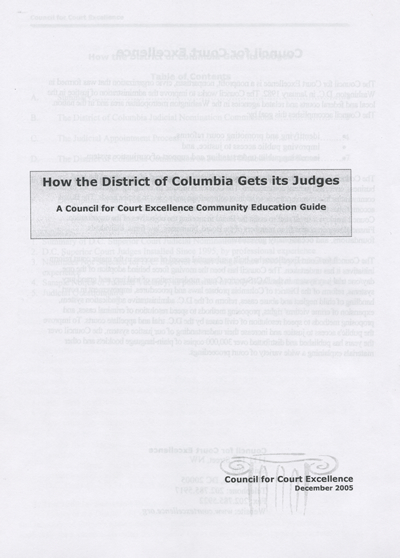 This 2005 report is a comprehensive guide to the merit-based judicial nomination and renomination process for the District of Columbia Superior Court and Court of Appeals. Until now there has been little information on this important topic available to the public in an accessible way. The Council for Court Excellence guide describes the nine steps of the appointment process, from notice that a judge is retiring to public investiture of that judge’s replacement, and it describes the two D.C. Commissions which participate in evaluating judicial applicants. Revised in 1999, the D.C. Victim's Guide is an accessible, easy-to-understand reference for a victim, their family or friends, or a witness of a crime who needs to better understand the steps involved in bringing a case to trial and the victim/witness' role in this process. Please call 202.785.5917 to order over the phone. The D.C. Victims Rights Amendment Act of 1988 provides victims of a violent crime with the opportunity to file a victim impact statement to be considered by a judge at the time of sentencing. This brochure helps you understand your rights as a victim of crime, and explains how to complete a victim impact statement form. Please call 202.785.5917 to order over the phone. In the District of Columbia and many other cities locating property stolen from you is only half the battle to recovering it. Should the police find your property, the prosecuting attorney often will hold it for identification purposes or as evidence in a trial. This easy-to-understand brochure helps you understand and navigate the procedures you need to follow to get your property returned to you. Please call 202.785.5917 to order over the phone. ($55 for video and Teacher's Guide). Through a 22-minute dramatization of an actual murder trial, this Council for Court Excellence interactive educational video places secondary school level and above students on a jury receiving instructions from an actual judge on issues they must consider when deciding the case. A companion Teacher's Guide contains background information on the jury system, discussion questions, suggested exercises and readings, and follow-up issues relating to the student's jury experience. The video and Teacher's Guide have been distributed to school systems, courts, and bar groups in over 25 states. Please call 202.785.5917 to order over the phone. Tips for courts to create their own jury service appreciation campaigns, based on CCE's decade-long experience conducting such appreciation campaigns. Developed in the 1990's and utilized by many states, the ideas for conducting your own campaing are still current. This comprehensive guide to neglect and abuse practices in the DC Superior Court Family Court has been written and peer-reviewed by experienced child neglect practitioners. Joanne Schamest and Leslie Susskand are the editors.